Coach Robert Reese "Bob" Neyland, ca. 1930. Robert R. Neyland, renowned football coach at the University of Tennessee, was born February 17, 1892, in Greeneville, Texas, the son of attorney Robert R. Neyland and Pauline Lewis Neyland. After high school graduation, he entered Burleson Junior College in Greeneville; a year later he transferred to Texas A&M, where he studied engineering and played baseball and football. In 1912 Neyland won a competitive appointment to West Point, where he continued his engineering studies and his athletic development. He played end on the 1914 and 1915 Army football teams, won twenty straight games in baseball (defeating Navy four times), and won the heavyweight boxing title three years in a row. After graduation from West Point in 1916, Neyland was sent to the Mexican border, where he was engaged in levee work and bridge and road construction. During World War I Neyland served in France. Before the war ended, he was assigned to Fort Bliss, Texas. In 1920 he took additional course work in engineering at Massachusetts Institute of Technology before returning to West Point in 1921 as an assistant adjutant and assistant coach in football, baseball, and basketball. He also served as aide-de-camp to Academy Superintendent General Douglas MacArthur. In 1926 Neyland was assigned to the University of Tennessee as R.O.T.C. commandant and also served as assistant to the district engineer for the U. S. Army Corps of Engineers in Chattanooga. In 1931 Neyland became district superintendent and supervised the dredging of the Tennessee and Cumberland Rivers. He also oversaw the preliminary surveys for Norris Dam, which was built later by the Tennessee Valley Authority. In 1926 Neyland became head football coach at the University of Tennessee. In the period from 1926 to 1934, Neyland’s teams won 75 games, lost 7, and tied 5. They lost only one game out of the 68 played on their home field. A firm disciplinarian, Neyland stressed speed and conditioning. He required that players rehearse plays until they could execute them perfectly. To Neyland, the most important game of the season was the one against Vanderbilt. In 1927 Tennessee played Vanderbilt to a 7-7 tie in Knoxville. Thereafter, the Volunteers lost only three times to Vanderbilt in 19 games. The army sent Neyland to the Panama Canal Zone in 1935. When the Volunteers lost all their major games that season, the fans demanded his return. 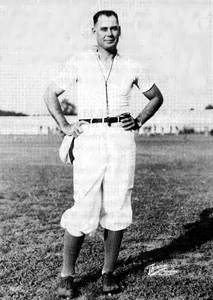 Neyland had found that he also missed football coaching more than he expected, and in 1936 he retired from the army and returned to Tennessee as head football coach. During his second round of coaching, Neyland coached George Cafego, Babe Wood, Sam Bartholomew, Jim Rike, Bowden Wyatt, and Len Coffmen. UT won 11 games in 1938; 10 in 1939; and 10 in 1940. Neyland’s defense limited the opposition to 42 points in 50 games. When the U.S. entered World War II, Neyland was called back into the service and assigned to Norfolk as district engineer. He was reassigned to Dallas before being sent to China and then Calcutta, India, where he served as port commander. He rose to the rank of brigadier general. Neyland was awarded the Legion of Merit with two clusters and the Distinguished Service Medal from the United States, the Chinese Cloud and Banner, and the British Knight Commander. In 1946 Neyland returned to coaching at the University of Tennessee. His 1946 team won the Southeastern Conference Championship, and the 1950 team made a postseason trip to the Cotton Bowl, ending the season with a 10-1-0 record. The next year, the Volunteers became the national collegiate champions. By 1952 Neyland was in poor health. He retired from coaching in 1954 but continued as athletic director. The first coach in the South to use press box spotters and the telephone to assist him in making coaching decisions, Neyland never exploited his reputation as a winning coach. He refused to lecture, write books, or appear on television, believing that the only thing that mattered was his winning record. He produced nine undefeated teams, forty All-Conference stars, twenty-one All-Americans, five Southeastern Conference championships, and one national championship. He was elected to the Football Hall of Fame in 1953, named the Football Writers’ Man-of-the-Year in 1954, and received the A. A. Stagg Award by the American Football Coaches Association in 1957. Neyland died on March 28, 1962, at the Ochsner Foundation Hospital in New Orleans, where he had gone for tests. He was married to Ada Fitch of Grand Rapids, Michigan. Their two sons were Robert Reese Jr. and Lewis Fitch Neyland.